Eolos. Instructions page. Beginners Level. - Persons with respiratory problems, as Asthma. - Persons in low fitness conditions. 1.- Hold Eolos on you hand with the mouthpiece looking at you. 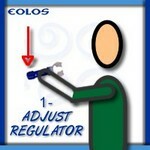 Adjust regulator (turning slowly to the right a few notches) to reach a low resistance level. 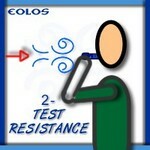 2.-Introduce mouthpiece in your mouth and test the resistance level doing an inhaling exercise. If you feel it is hard to inhale, turn the regulator more to the right until you find the perfect resistance level for you. In case you feel that the air comes through too easily when inhaling, then turn the regulator to the left until you find the perfect resistance level for you. Repeat step as many times as requires until you find the level in which you feel comfortable inhaling. Always choose the training level according to your physical strength level. Get to know your limitations and train within your boundaries. Always use common sense when performing a breathing exercise. Once you have obtained the desired resistance level, move to steps 3, 4 and 5. After regulating the resistance level, place the mouthpiece in your mouth and do a long inhale. 4.- Hold breathing for about 2-5 seconds. 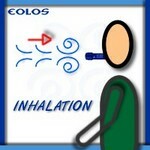 5.- Exhale air through the device. Congratulations! You have finished doing your first exercise with Eolos. If you finished the first round perfectly, then repeat steps 3, 4 and 5. If required, take the mouthpiece out of your mouth and do 1 or 2 free breathings before repeating levels 3, 4 and 5. 6.- On average, the daily session should last about 5 minutes, but if you feel it is too much for you and you end up extremely tired, then we suggest you try 5 sessions of 1 minute each spread through the day. Always listen to your body. It is DETRIMENT to choose the training level that suits best your current physical strength. If at any time you feel weak or dizzy, STOP the training immediately. You should also stop training if you experience stress, pressure or pain at any given point during the exercise. Seek your doctor before retaking the breathing training. - Next step after training at Beginners Level. Please note that these levels are for reference purposes only, as Eolos's regulator can be regulated at diverse levels. At any point you wish, feel free to change your training level either by increasing or decreasing it. The same applies to the training duration. Your fitness level and goals will determine this. 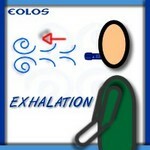 Used correctly Eolos can be used by almost anyone and has no harmful side effects. Very occasionally, however, there may be instances in which the creation of a large negative pressure in the chest may exacerbate an existing condition. As such, if you are on medication, suffer from a medical condition (e.g. asthma), or are uncertain as to whether Eolos is suitable for you, then you must consult your doctor prior to commencing training. Above all, unless advised by your doctor, you should not stop taking any medication. Eolos is intended to complement existing treatments, not replace them.